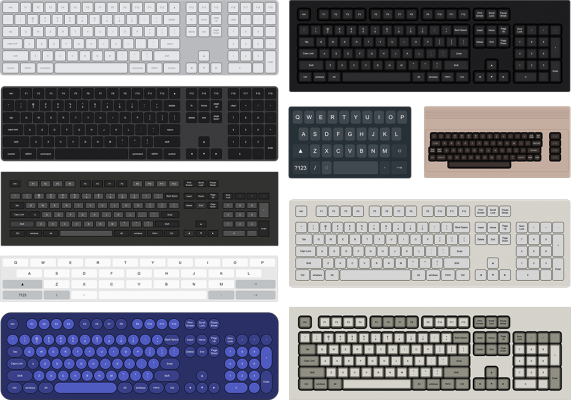 highly customizable keyboards together with user defined typing animations. It saves you an incredible amount of designing time. If you want to create an animated typing keyboard, this is your tool! to create virtually any type of keyboard. Azerty or Dvorak keyboard layouts. the Function, Modifier, Navigation and Numeric Pad Keys. In order for keyboardFX to illuminate other than alphanumeric keys (e.g. the function keys, arrow keys etc.) a special code must be typed. This special code is nothing more than double curly brackets before and after the name of the key. and then press the "Generate keyboard!" button. Here is an example list of codes for the special keys of a PC keyboard. You can easily adjust the typing speed as well as the glow decay. Below is an example of various values of the "glow decay" effect control. Once the keyboard has been created, you will find the following effect controls in the effects panel of the keyboardFX shape layer. - changed: keyboardFX no longer uses the "Arial" font as the default font for every text layer it generates. It will now use what ever font is selected in the After Effects Character Panel upon generation. Designed to create loading or progress bars, fast and easy. It is ideal for artists who create HUDs, UI elements, infographics, charts, TV/News graphics etc. Designed to create any type of graphical measuring ruler, fast and easy. It is ideal for artists who create gauges, scopes, speedometers, graphical equalizers, HUDs, UI elements, historical timelines, instrumentation layouts, infographics etc.